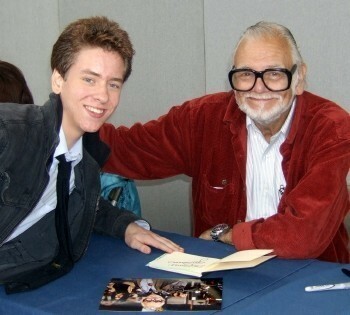 George Andrew Romero was born in New York, in 1940. His father (of Cuban descent) was a commercial artist. George had become interested in film making from an early age, after his parents had given him an 8mm cine camera for his birthday. 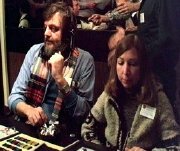 He attended Pittsburgh's Carnegie Mellon University and after graduating from there in 1960, began making short films and commercials. He clearly liked Pittsburgh as it was later to become the setting for a number of his films. During the following decade, Romero made low-budget, horror-related films like There's Always Vanilla (1971) and Hungry Wives (1972). Then came another low-budget horror film The Crazies (1973) where a deadly virus which causes death and insanity to those infected, takes over a town in Pennsylvania. Land of the Dead, which follows a Romero tradition of casting an Afro-American in the role of the hero, cost $16million to make! Day of the Dead was a financial failure. It was slated by the critics at the time and Romero's career began to go downhill. Although his next film Monkey Shines (1988), featuring Romero's wife Christine Forrest, won several awards, neither The Dark Half (1993) or Bruiser (2000) did much to halt the slide. After the great success of Dawn of the Dead, and with bigger budgets, Romero directed Knightriders (1981) and Creepshow (1982), adapted from a story by horror novelist, Stephen King. In 1978 came Dawn of the Dead which follows the exploits of two TV workers Stephen (David Enge) & Francine (Gaylen Ross), and two special policemen Peter (Ken Foree) & Roger (Scott Reiniger). To escape the zombie hordes, they take refuge in a shopping centre, but as the weeks go by their defences crumble. Dawn of the Dead cost $1.5 million to make but earned over $40 million at the box-office! It was also noteworthy for the brilliant work of make-up artist Tom Savini who later teamed up with Romero on several later zombie productions. With an interest in the 'horror genre', Romero and a group of friends got together to form 'Image Ten Productions' in 1967. They each contributed towards the $100,000 required to make Night of the Living Dead (1968). This film about flesh-eating zombies, was shot in black & white, and went on to make a substantial profit at the box-office, as well as becoming a cult classic. Five years later, Romero directed his own screenplay Martin (1977) in which a young man, who thinks he is a vampire, becomes well-known after calling in to a late-night radio show - but is he really a vampire? The film stars John Amplas, and is widely regarded as Romero's best non-zombie film. Romero's future wife, Christine Forrest plays Christina, whilst Romero himself has a cameo role as Father Howard alongside Clifford Forrest (Christine's father) who plays Father Zuleman. 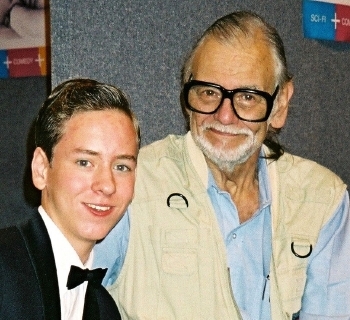 It was brilliant meeting the great George Romero at the NEC in November 2005. He had a long queue all day but he talked to us all, and was extremely friendly. 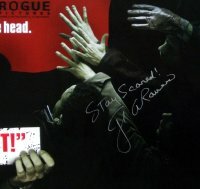 He signed my zombie posters and later, I had a photo taken with him, which he also signed. 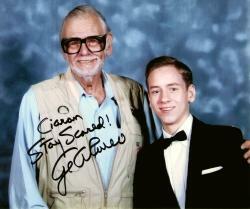 I met him again at Collectormania in Milton Keynes in October 2007. We had another chat (about British comedy!) and he signed my autograph book and a photo. power struggle, the zombies from above ground eventually invade the bunker. played by Dennis Hopper), who help the poor in exchange for power and the right to live in a huge paradise building called Fiddlers Green. 'Dead Reckoning' is the heavily armed and fortified tank that is used to bring in whatever is needed. With the very survival of the city at stake, a group of hardened mercenaries is called into action to protect the living from an army of the dead. The zombies, led by 'Big Daddy' (Eugene Clark) eventually gain access to the city by crossing the river, and all hell breaks loose. can see how much he cares about it." group of film students who run into 'real' zombies when they are making a horror film of their own. Tina made a brief appearance in Land of the Dead as the 'High Noon' Soldier. George Romero died on 17th July 2017 aged 77.